Nastasya is an immortal, and she’s been partying to forget the pain of her tragic childhood for hundreds of years. But when her fellow immortal, and best friend, Incy starts using magik to hurt people, Nastasya flees to a rehab house for wayward immortals. First off, I want to address the title. 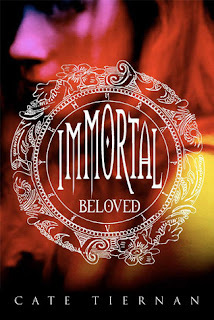 Immortal Beloved is somewhat of a misnomer, because there is no one here being loved immortally (at least not in this installment of the purported series). I was expecting something along the lines of THE ETERNAL ONES (see my review) where two people love each other across time, but instead this is more of a learning to love yourself story. Nastasya, or Nasty as her friends call her, is a train wreck at the start. It’s interesting that she’s considered a teen protag despite her immortal age, but of course, she certainly is stunted emotionally and has aged so little physically that she looks like a teen. Nasty has a lot of demons in her past, but finally decides she wants to better her existence – or at least escape the pressure for a little while. Enter River’s idyllic farm. Nasty finds everything boring and beneath her at first (and her snide asides are infinitely amusing), but after a lot of back-breaking work and stargazing starts to let herself heal. Since this is more of an internal process, the vast majority of the novel is either following Nasty’s daily drudgery at the farm or flashbacks from her past which shed light on her emotional state. Surprisingly perhaps, this all worked for me, and I very much enjoyed seeing Nasty emerge from her shell and interact more with the other immortals at the farm (though I must confess, I had a hard time keeping some of them apart) as well as the mere humans around the town. There’s also a fair amount of immortal mythology and magical powers woven in which I found quite fun. I am looking forward to Nasty’s further adventures. IMMORTAL BELOVED is out in hardcover now. Find out more about it and read the first chapter at the author’s website. What are your thoughts on the main character's name? Seems like a turn-off from the book for me? I don't think this one's for me. Anna - Nasty is just the latest in a series of names the main character has made up for herself. I think it's supposed to reflect her state of mind? Maybe she'll change it in the next book! But yeah, I don't like it very much. I've liked this authors Sweep series a lot. I may have to read this one. I kind of think this sounds amazing, actually. I don't know why, but it kind of appeals to me. I'll def be checking it out. Great review! It sounds like an fun book - the colors on the cover really appeal to me, and the rehab house for immortals sounds like an even more interesting setting! I read her SWEEP series when I was in middle school and loved it but I keep passing this book up for some reason. After reading this, I'm still not sure I want to give it a go. The cover is appealing, but it doesn't really sound like it goes with the story. I'll still have to think about this one. Thanks for the review! I could not get into this one. I read the first 100 pages and it didn't grab me at all. I think because of the title and my expectation that I'd see a bit more romance. Not that this is required of every book, of course, but I'm never good at readjusting my expectations lol. Michelle - Hence my discussion of the disconnect between title and actual content. Like I said, I expected a romance too. And while there *was* a dash of romance, it was definitely not the kind I'd tag with "immortal loving". For some reason this was a paranormal romance that just worked for me. I'm looking forward to the next books in the series as well. I love the cover for this book! I actually got this in the mail this week and the UK arc cover is simply divine. And I totally understand what you mean, I would expect this to be some trite cliched book about loving someone forever and in a way i'm glad it's not, those type of books just dont roll with me anymore. So glad to hear that all these elements worked for you and that you enjoyed the book. It does sound kind of interesting, and not like something I would normally read. Thanks for sharing your thoughts on it with us! This sounds so interesting - new title to me and total cover love! I've come *so close* to picking up this book every time I see it. Yours is the first review I've seen so thanks for sharing. Frankfurt Book Fair + Tori Amos with Orchestra!